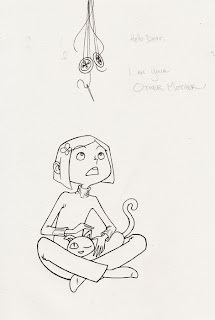 Today's sketch is inspired by the animated film I saw last night, Coraline. I first heard about the movie after learning that some artists I follow worked on it, but I had no idea that the entire movie was in 3-D! I had never seen a movie in 3-D before, and I was excited to seize the opportunity to do so (even though renting the glasses cost an extra $2). 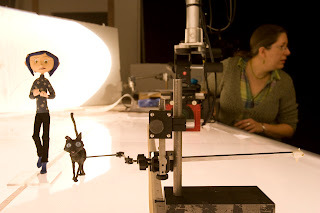 Stop-motion animation is incredibly impressive when it's done well, and Coraline completely surpassed my expectations. 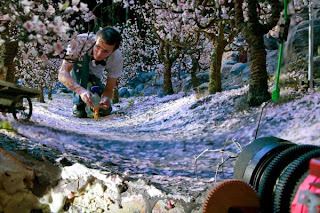 The 3-D aspect of the movie definitely adds a "wow" factor. I remember back in the day when 3-D meant dorky red-and-blue glasses that completely distorted your vision and left you nauseated, but the glasses from last night worked so well I barely noticed them the whole movie! The story follows Coraline, who had just moved into a haunted house and explores a magical "other" world. It was developed from a fantasy horror novella written by Neil Gaiman and there are definitely some really creepy themes present. I say this because a lot of parents associate animation with kids-friendly movies, but a lot of animated films nowadays are aimed at a much older age group. 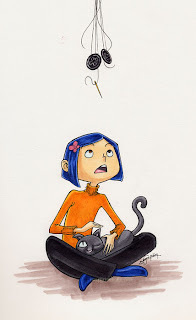 In the magical world of Coraline, Coraline's "Other Mother" is obsessed with sewing buttons onto her eyes. For this movie fan-art, I wanted to incorporate the creepy buttons into the drawing somehow. 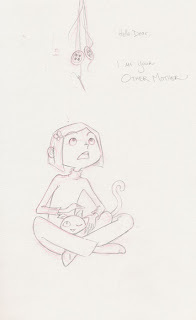 First I laid down my usual rough layer in red and drew in the final lines with a regular graphite pencil (top image). I then inked the drawing using bleed-safe pens and erased the pencil sketches (second image). The final picture below is colored with alcohol-based Copic and Tria markers which I find excellent for blending. I normally do not use references for my drawings, but each time I do so, I recognize how they help me visualize the characters or settings. Even though I don't copy the drawing style, pose, or composition, references help by adding an extra layer of thought. The photo above was probably the most inspiring. 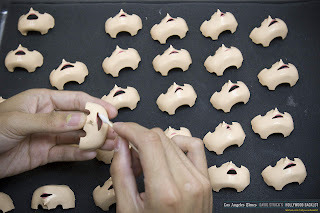 It gives you a great sense of scale of the movie—both how grand, in terms of the amount of work that was put into making each doll and facial expression, as well as how small and miniature the entire production set is. Have you seen Coraline? If you did, what were your impressions about the set? Characters? Plot? I did! It was ridiculously charming. Although I never gave it a full elaboration on my thoughts about it, I've drawn some stuff based off of it too! I saw it on its premiere-date, and it continues to charm me like crazy! However I knew of the movie since early 2008, and always had a good feeling about it ever since!